The Quilt hosted the Fall 2018 Member Meeting at the University of Maryland, College Park, on Sept. 25-27. It was an informative and exciting three days with our Quilt community discussing advanced networking for research and education. We also had the opportunity to once again collocate our fall meeting with the NSF’s Campus Cyberinfrastructure and Cybersecurity Innovation for Cyberinfrastructure PI Workshop and ESnet providing a unique and dynamic forum to bring together some the country’s brightest networking minds together for dynamic programming and networking opportunities. View the entire program agenda here. Dr. Ben Brown, Acting Director, Facilities Division and ESnet Program Manager, U.S. Department of Energy’s Office of Advanced Scientific Computing Research talked about Quantum physics, strategic issues on high-performance computing and networking, and how the DOE is a steward of national research infrastructure. View his presentation here. A panel discussion on Network Performance and Measurement highlighted innovative efforts by R&E networks, non-profits, industry and government agencies for instrumenting community anchor institution edge sites. The panel was moderated by James Deaton from Great Plains Network and included Georgia Bullen from the Open Technology Institute Measurement Lab, John Hess at CENIC, James Miller from the FCC, Chip Popoviciu of Nephos6, and Joe Sawasky at Merit. Jean Rice is a Senior Broadband Program Specialist for the NTIA’s BroadbandUSA program. She focuses on the development of new broadband initiatives for local, state and tribal governments as well as planning and implementation efforts for Smart Cities and Communities projects. 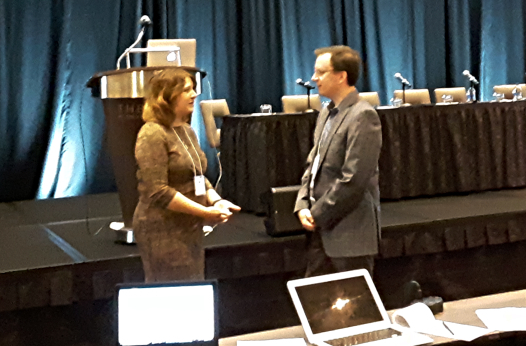 During our Fall Member Meeting, Rice discussed moving the rural broadband needle through Land-Grant University Cooperative Extension Offices, Global Cities Team Challenge Smart Agriculture, and Rural SuperCluster. When it comes to building smart regions, she noted that things exist already to enable collaboration across sectors and that by tapping those resources will provide a faster and critical starting point. 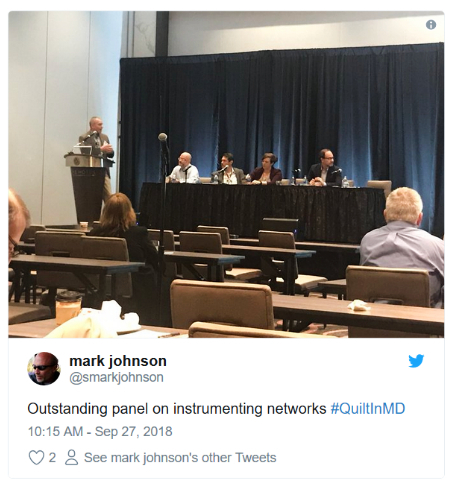 If you want additional insights into other discussions and ideas ignited by the event, search #QuiltinMD on social media channels. Thanks again to all our speakers and participants for their insights, time, and knowledge. We’ll see you again in February 2019 for our Quilt Winter Member Meeting in La Jolla. Event information already is available.